A visit to Marina Bay Sands & Sky Park, one of Singapore’s newest icons and landmarks, a beautiful and modern design hotel, convention centre, shopping, entertainment and casino all rolled into one location. I was invited by Nellie a.k.a Wild Junket, a well known travel blogger and writer, who was back home in Singapore for holidays, to visit, explore and “research” Marina Bay Sands (Nellie was on assignment). It was an eye-opener visiting Marina Bay Sands, however, I would only be sharing my photographs and experiences on Sky Park, something that I wanted to visit since it was open. Simply, the view from the Sky Park is so beautiful especially in the evening and in the night. 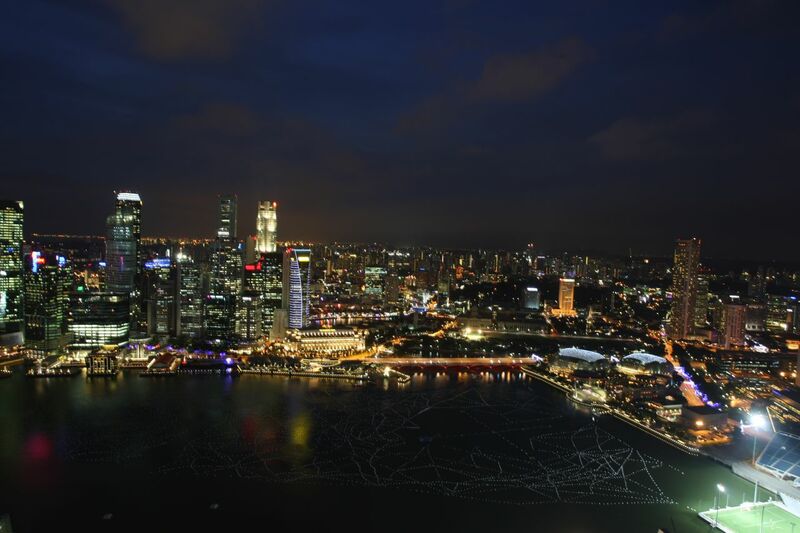 The Marina Bay Front is building up as a new cosmopolitan business and entertainment hub of Singapore and once the nearby surrounding areas are fully completed, the wide panoramic view would even be greater. High up in the skyline of Singapore, awesome magnificent views, great place to catch the fireworks and Singapore F1 GP, I would love to go back up there again someday for more photos taking and capture a beautiful sunset !